Today we go all The Bard and see a marriage that is clearly not a happy one. FART are off-world, still looking for tech that’ll prove beneficial for the Expedition, finding themselves on a seemingly simple farming world. Their initial impressions are left broken however when they are brought to the Tower, a buried city-ship that acts as the holding of the areas feudal lord, the Lord Protector, and uses its drones to defend the planet against the Wraith. Soldiers from the Tower soon show up and begin to abuse the villagers for no reason but are stopped by the Lord Protector’s Chamberlain Otho, who has Sheppard taken prisoner when he scans them, using a demonstration of the drone weapons to force their submission. Brought to the Tower, Sheppard finds that the Lord Protector is an old man of questionable health and whose only heir is basically Joffrey without the crossbow fetish along with his rather empty-headed if good meaning daughter. Despite the lavish surroundings it’s clear the situation is similar to medieval sates, with a few lavish aristocrats ruling over a peasantry who are oppressed with ruthless efficiency. After the feast that night the Protector’s ill health is displayed openly while Sheppard is propositioned by the Protector’s daughter who would become ruler if she was to marry the newcomer. 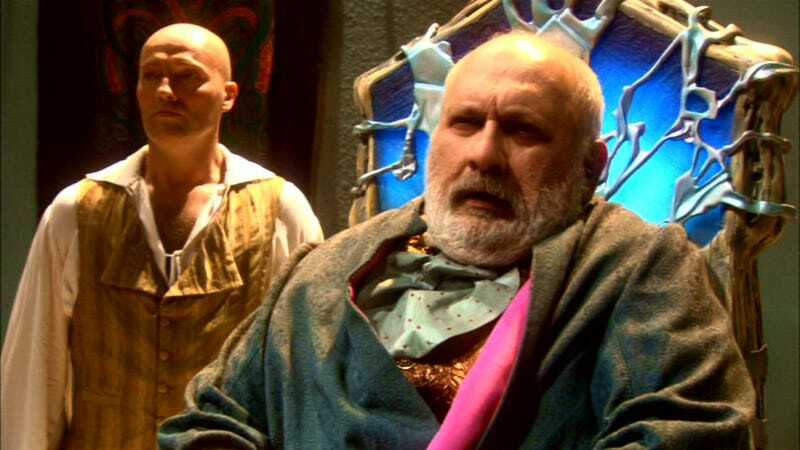 The next day Sheppard goes to Otho who reveals that the ability to use the “Throne” (an Ancient Control Chair) is slowly fading from the Royal family and that Sheppard is seen as the ability to replenish the bloodline given his ability to use the Chair. Sheppard however decides to provide Otho with the ATA Gene Therapy from Beckett, believing that Otho could change the society for the better as a result, but unknown to Sheppard Otho already has an arrangement with Joffrey. While trying to care for the Protector Beckett discovers that the Protector is being poisoned, with Sheppard viewing Joffrey as the cause. When the Protector finally dies Sheppard tries to save Mara, seeing her as an innocent in all this and now likely to be murdered by her brother, but is stopped when Otho reveals himself to be the mastermind behind the Protector’s death as only he had the skills to use poison. Outside the Tower the rest of the team try to decide what to do. While Rodney is more focused on the source of the Drones and other scientific aspects Ronon and Teyla are instead more interested in helping the people break free from the control of the Tower. When the soldiers begin abusing the villagers once more Ronon steps in, causing the start of a general uprising. Meanwhile Rodney and his local guide have begun to explore the ruins of the rest of the city to search for the Drone storage bays to see if they have any remaining, finding vast quantities in storage. Activating the lights however triggers a tremor that ends up collapsing their way out. Eventually he’s able to use a drone to create a hole big enough to allow a radio signal out and regains contact with the others, who report that Beckett and Sheppard have stopped talking to them and that the Tower is likely to attack the villagers who’ve revolted. Unable to pull the ZPM he instead starts the engines to drain it instead. The resulting tremor provides enough of a distraction to allow Sheppard and Beckett to escape with Mara’s help and stop Otho. Upon confronting Otho in the Throne Room Sheppard is forced to fight the man, easily stealing his knife from him and cutting hm. It turns out he blade was laced with poison which quickly kills the man. The team subsequently leave the planet offering help and assistance with forming a new system of government. The Tower is a standout episode of Atlantis, not because of whether it’s good or bad but because it has a very unique concept and feel to it that’s never revisited by either show. The episode largely takes place to begin with in what appears to be just another medieval peasant village but quickly transitions to this very distinct late medieval, almost Renaissance Europe look to it in the form of the Tower itself. It’s a stark contrast that’s deliberately beefed up through the juxtaposition of scenes such as the feast versus the local dinner and the villagers sharpening scythes only to look up and see drones approaching from above. Aside from just the look, he feel of the Tower also has an almost Shakespearean vibe to it with many characters playing slightly exaggerated traits seen in the Bard’s plays. Otho is very much the knowing servant who feels overlooked and takes what he wants, “Joffrey” the spoilt heir who’ll meet his fate soon after killing another, and Mara the maiden to be saved. They’re not the most complex characters ever seen but they do the job needed of each well within the limited timeframe available. Otho in particular is built up rather well given what little time there is, laying a framework for explaining why he’d turn on the others and seize power for himself. From a wider perspective the Tower as a setting for the episode largely feels as a way for the team to restock their Drone supplies more than a distinct location by itself in many ways, given that the wider mythology of the show isn’t really altered much by the episode. The explanation for the city-ship being there is also pretty rocky at best, with the central spire surviving wholsesale while the rest of the city has disappeared. One of the strangest aspects of the episode is that it’s very much a story of Regime Change on a series that has tried to avoid the topic as much as possible. In the early days of SG-1 it focused a lot, admittedly, on episodes that saw the team removing a feudal oppressor and freeing the people. The key difference of course was that this was in fact stories where a foreign intervener was controlling the country and the team intervened to let the planet decide for itself. This time however they intervene with people of the same planet and remove their own government and instead explicitly state they’ll “help” form a new type of government for them and this planet is never visited ever again. One of the great parts of the current storylines on the parent show was the issues facing the Free Jaffa now having to create a system of government for themselves and the problems that has so it’s a shame to take such a massive step backwards. In conclusion The Tower is a unique episodes in terms of style and the themes it seems to put across, with it suffering in the latter due to the strange conclusions it seems to draw and the ignoring of long-term effects such actions could have. · I see they raided the Renaissance Fayre for costumes. · Hold on, Drones require power to work? That’s a bit crap. · Can’t wait for the followup where the team get involved in a decade long struggle dealing with radical militants unhappy with their regime change. · The idiot villager is called Baldric? Okay, who watched Blackadder before thinking of that. The team are exploring the area above a planet in a Jumper, only to find a pair of what appeared to be stasis pods. The team decide to bring them back to the city, where a now parasite free Caldwell is also visiting, to allow Beckett to run studies on it. Upon opening the first pod they find an elderly woman on the verge of death but when Weir steps closer the pod beams a bright light at her face, rendering her unconscious. Upon waking in the infirmary it’s revealed that Weir is now host to an imprint of the woman in the pod, calling herself Phoebus and claiming to be a peaceful explorer. Upon letting Weir take control of her body again Weir claims that the imprint will only last a few hours and that the other pod contains Phoebus’ husband and asks that Sheppard become host to the imprint of the other pod. Upon taking the imprint of the other person, Thalan, it’s revealed that the two are in fact soldiers from the opposite sides from an unknown war long ago and wish to use this time to settle old scores by fighting to the death. Despite attempts by security teams to stop the pair both easily subdue and escape their pursuers, instead trying to hunt each other down. Thalan shuts down the city power, preventing the Expedition from easily tracking them down, and later gets help when he manages to trick Ronon into helping him hunt down Weir. When Ronon is injured in the resulting firefight with Phoebus however he surprisingly calls for a medical team before heading of in pursuit of Phoebus, later stunning Teyla as well when she gets in the way. While the fight is continuing Rodney manages to fix the power at Caldwell’s behest, only for Phoebus to activate a general lockdown and hold the city to ransom by demanding that Thalan is delivered to her. Teyla, upon recovering from her earlier stunning, is able to reciprocate her predicament from earlier when Thalan attempts to open a door, dragging his body in front of a camera when requested. Upon waking himself he claims to be Sheppard though this is quickly seen through. Phoebus instead demands Thalan’s execution in return for not killing the Expedition with Halon gas. Thankfully before she’s forced to execute him Rodney is able to lock out Phoebus’ access via Weir. Shortly after Thalan goes into convulsions before claiming to be Sheppard upon recovering. The pair are cornered by Phoebus when she checks on him, but Teyla instead chooses to pass a stunner to him that allows him to deal with Phoebus before Teyla disarms him. When Sheppard/Thalan questions why she’d trust him Teyla explains that both of them would’ve stunned Phoebus. The next morning Weir recovers in the infirmary, hours after Phoebus’ imprint fails, in the bed next to Sheppard. Caldwell visits the two, remarking that at least they know what he went through, offering to do the paperwork regarding the incident before leaving the pair to it. This is one of the few thriller based episodes of the Atlantis runs and it’s definitely one of the strongest. A well-written and filmed episode that puts the team in great danger while not featuring out of control plots across other planets that can see corners cut to fit the 42 minute window. The mainstay sees entities inhabiting Weir and Sheppard go on a quest to kill each other throughout the city, with each of their new personalities remarkably different. It’s interesting how Sheppard as Thalan is almost an anti-hero rather than the threat himself, deliberately choosing multiple times to avoid the deaths of the Expedition by either stunning them or getting help for those who were caught in the crossfire. By contrast Phoebus actively uses the lives of the Expedition as either bargaining chips or sees them as expendable as long as she kills her main target. It’s quite an interesting depiction when the focus could’ve been simply on how the Expedition fixed the issue but instead choosing to place the new personalities at the core of the episode every step of the way. It also served as a more radical way to save money for later episodes while not having obvious cutbacks in the operation, given we’ve seen mind sharing before with Rodney. The episode is also used as a way for Caldwell to make a welcome return and already the show takes strides to show the changes in his personality since the removal of a Goa’uld parasite. Already we see that while he can still be regimented in thinking during emergency situations, with him arguing with Rodney over chain of command and how to solve the situation, he’s remarkably more relaxed and friendly in the off-hours, taking the time to visit those in the infirmary at the end of the episode while also having attempted to apologise for what had happened earlier in the season while under the control of the Goa’uld. It reminds me a lot of the treatment Hammond had during the first few episodes of season one of SG-1 where he went from by the books leader to pretty much a lovable grandpa. Overall the episode is a nice little thriller piece that reintroduces new versions of old characters and has the actors play more interesting roles from the ones they usually play on the show, with action and intrigue in equal measure and some nice development of the recurring cast. · Daedalus sounds like a really boring assignment these days. Little more than a glorified delivery service. · I’m guessing in the future more systems will need two-people authentication to stop this sort of stuff happening again.